When his uncle found out about his powers he told him a very well known statement: With great power comes great responsibility. The reality is that no matter how much skill, talent, power or money we may have, if we’re not neighbourly or friendly, it will never leave an impact. Paul says in 1 Corinthians 13…you can have everything, but without love, you have nothing and you offer nothing. Neighbouring is the most common and everyday activity we engage in. Yet so many of us have a hard time being neighbours to one another. As we make this invite and ask this question, the truth is this, weather we accept or decline, the reality stays the same, WE ARE NEIGHBOURS. The real question is, what kind of neighbour will you be? Next week we’ll dive into the issue of diversity and neighbouring: acknowledging that we are all the same, and yet all different, and of course, how do we move on from there. We’re going to close it up on Canada day with a ‘Neighbourly Challenge’. Today, let’s remember why we’re discussing this – we get to this conversation because Jesus is asked a question. The question isn’t about a neighbourly dispute, rather, it’s about faith and spirituality. Jesus connects our faith to our neighbourliness – he connects our love of him to our love of neighbour. Jesus responds with a story. – The Samaritan wasn’t intentionally going anywhere, he was simply travelling and came across this opportunity. – The Samaritan walked across the road to get close to get close enough to serve his neighbour. – He did what he could with what he had. Simple. Practical. The Samaritan is the unlikely hero in this story. He is aware enough to see the need that faces him. He is close enough to do something. He does what he can with that he has. He has no super powers. No extra-ordinary ability. No cape, no x-ray vision, no super suit, no webs, no team of avengers to help him. He does what he can with what he has. If we want to become the kind of neighbour Jesus is inviting us to be, we don’t need any powers, we don’t need more money, we don’t need more time, we don’t need a fancy suit. All we need is what we already have…coupled with compassion & presence. Back to Spider Man. I know he has a cool suit, and some interesting and useful powers, but the what makes him stand out is simply found in his title: Friendly Neighbourhood Spider Man. We’re fooled to think that we need more of anything to make a difference. You have all the gifts and tools you need to make a difference. As long as you are a man who is able to be Present & Compassionate, you will influence and encourage your kids and/or anybody God puts in your path. Rogers took risks, pushed the envelope, was super creative with very simple tools, and taught a generation of kids how to be neighbours. He knew that living with humans is harder than it looks, and rather than taking it for granted, he wanted to help people get along. Neighbouring is the most common and everyday activity we engage in. Yet so many of us have trouble being neighbours to one another. Every time you’re with another human being, you are practicing the art of neighbouring – you’re either doing it well…or not so well. As we make this invite and ask this question, the truth is this, weather we accept or decline, the reality stays the same, WE ARE ALL NEIGHBOURS. I guess the question is, what kind of neighbour will you be? The Bible (NIV) has 144 references to the word Neighbour. Proverbs and other OT books give us wisdom and practical advice on how to navigate relationships with our neighbours. When we think of neighbour and the scripture, the first place we might go to is Mark 12 or Luke 10. Love God with…all your heart, soul, mind and strength. He could’ve stopped at LOVE GOD and we would’ve got it. We might even have liked that response better. Sometimes it’s easier to love God than to love people…actually…most of the time. But he doesn’t. Jesus never stops where we think he should. He always goes further – always goes deeper. The two best words in the Bible might be BUT & AND. Because when they show up, you know the next thing coming is important. Love God…AND…Love your neighbour as yourself. Jesus says…this is how to love your neighbour. Interesting that in other places in scripture we’re told to put others before ourselves or put others interests above ours. But here, Jesus says, the way you love yourself, you must love others. #1. Love yourself. See yourself in God’s image of you…see yourself the way God sees you. #2. Love your neighbour in the exact same way. Why do you think we have all the conflict and unrest we see in the world? Why war? Why violence? Why hate? Why unrest? Why walls? Because we always (or often) only see our neighbours as ‘other’ and not ‘us’. The word ‘Yourself’ in this scripture is really important!!! It changes everything. We often hear the challenge to be a better neighbour and go right to Jesus and the gospels. Like we just did. Rightfully so, Jesus made that audacious claim about loving God & Others. However, Jesus takes both the first part of his statement (Love God) and the second part (Love your neighbour) from the OT. First one is from Deuteronomy 6. The second? Leviticus. Of all the places to narrow down your most important commandment? Leviticus? Other than numbers, it might be the toughest (and most boring) book to read in the bible. It’s important to note the context of Leviticus: this neighbouring is about those who are close by (Israel as a nation and community). There are many scriptures about the foreigner and the alien and the refugee (more on that in the coming weeks), but here, it’s about the people who live close to you. Who are the closest to you? Who is it that you do life with most? Who are the ones most effected by your decisions, your actions, your behaviour? Start there! No really, start becoming a better neighbour with the people who are closest to you. Be a neighbour first to the people who are the closest. Here’s the thing, if you can’t be a neighbour to them, how can you be a neighbour to those who are different than you? Who are far from you? Neighbouring takes thoughtfulness & action; wisdom & patience. All those practical bits of wisdom from Exodus, Leviticus, and Proverbs are helpful. Just like every other role we play, husband, friend, wife, dad, leader…we are getting better at those things, we can be getting better at neighbouring. Here’s a statement to adopt, ‘I am becoming a neighbour’. In Mark & Luke Jesus turns the religious leader’s understanding of Moses’ law on it’s head…it’s not about how neat and tidy you follow the Law, rather, it’s how lavishly you can live out God’s love. We have this all wrong when focus on big attention, which might only bring little impact. One of the questions you may want to start your day with are, ‘What can I do for _____________ today?’. Ask this about your wife, husband, kids, friend, co-worker, etc. Who knows what God can do with that kind of loaded question. Accepting the invitation from Jesus to be a neighbour will challenge you, but it will also change you. 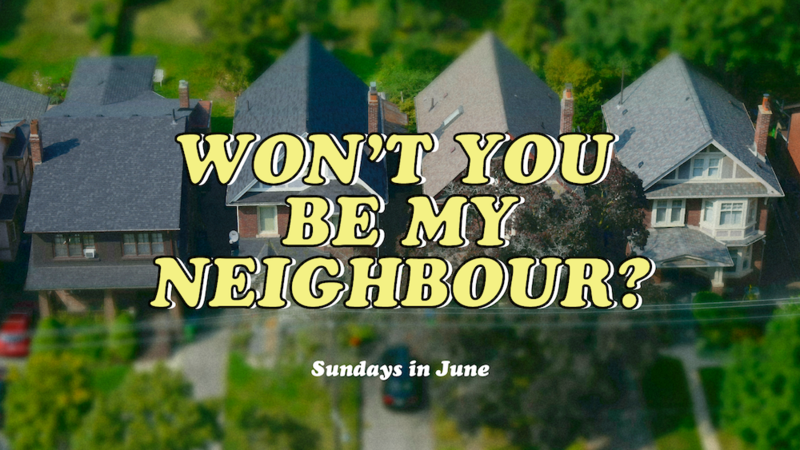 So…Won’t you be my neighbour? Nationalism defines neighbours. The gospel doesn’t give us that permission. We don’t define neighbour by street, block or town. Not too many people want to actually talk, they only want to tell. If you want to talk, you have to be able to listen. Learn to be present with others. Don’t interrupt with your story. The biblical test case for love of God is love of neighbour. People may hate us because of Jesus, but they should never hate Jesus because of us. Love your neighbours. Not the neighbours you pick out, but the ones you have. This past weekend we had the privilege of hearing from Todd Lester. Todd works for Be In Christ Canada, the fellowship of churches we are grateful to belong too. Todd used his time with us to teach through the three values Be In Christ Canada has chosen to reflect and live out: BELOVED, BELONG, BECOME. These values are very much connected to our own values at The Village: DISCOVERY, STORY, COMMUNITY. Can you make the connection? Below are scriptures Todd used to walk through these values. Take some time to read them, pray through them, and see how God challenges you through them. a house on solid rock. Cheerfully share your home with those who need a meal or a place to stay. confused and helpless, like sheep without a shepherd. How are these values connected to the gospel, the good news of Jesus? God loved and chose us before he knew us (Ephesians 1). How does that make you feel? What do you make of the Augustine quote? Which scripture speaks to you most about community and belonging? Why? One of our favourite words at The Village is becoming – what do you think it takes for us to be challenged and grow, while at the same time being patient when we’ve yet to arrive at the place we want to be? Which one of the values do you resonate with more? BELOVED? BELONG? BECOME? Why?